Unlike the Zappiti Player 4K, you no longer need to use Zappiti Transfer to transfer your files to the Zappiti player from a computer through the local network. Since firmware v3.06 Zappiti 4K HDR media players offer an SMB server function with automatic detection on the network. This allows you to access the contents of the hard drives connected to your Zappiti drive from a computer or Blu-ray drive compatible with SMB such as the OPPO brand drives. During the first scan, you will be prompted for a username and password. Leave the fields blank and validate. 1. On your PC, launch the Windows Explorer (WINDOWS + "E" key). 2. In the path (URL) field, please type \\ZAPPITIHDR (ZAPPITIHDR preceded by a double anti-slash ("ALT GR '+' 8 'key on the Windows keyboard)), then validate by pressing ENTER key on your keyboard. After a few seconds you will see the hard disks displayed in the Windows Explorer. You can then associate a network letter to the shared folder (Disk_sda1 or Disk_sda1) by right-clicking on the shared folder, then "Connect a network drive". The SMB throughput on the Zappiti 4K HDR is extremely fast: up to 115 MB/s, so the same throughput as USB 3.0. Alternative procedure with the IP address of your player. 2. On the home page, click the "SETTINGS" button at the top left. 4. In the Ethernet control panel, locate the IP address (for example, 192.168.1.88) and write it down on a paper. 6. In the path field (URL), please enter the IP address of your Zappiti 4K HDR, preceded by a double anti-slash ("ALT GR '+' 8 'key on the Windows keyboard), then confirm by pressing the ENTER key on your keyboard. WARNING! It is imperative to put both backslashes "\\" (backslashes) before the IP address. 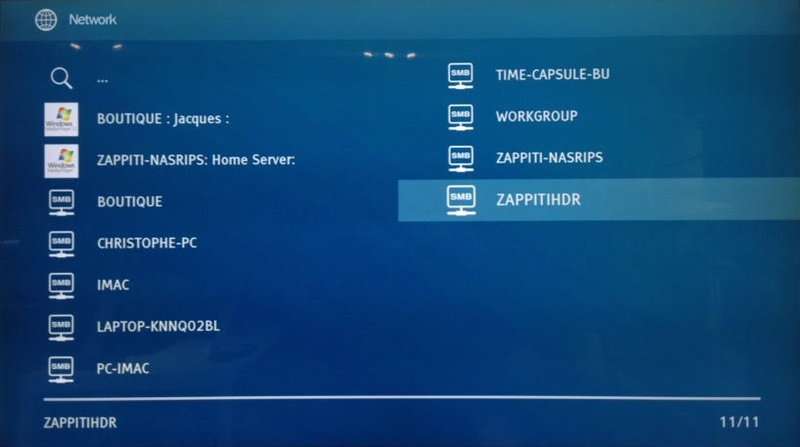 After a few seconds you will see the hard disks connected to your Zappiti displayed in the Windows Explorer. First at all, you have to collect the IP address of your Zappiti player. 1. Switch ON your Zappiti player. 2. On the Home Page, please click on the SETTINGS button located on the top left of the screen. 3. Click on "Ethernet Configuration". 4. In the "Ethernet Configuration" panel, locate the IP address (for example: 192.168.1.88) then write it down on a paper. 2. In the path (URL) field, type a dual back slash then typ the IP address of your Zappiti 4K HDR player, then validate by pressing the ENTER key on your keyboard. 3. After a few seconds you will be abble to see the hard disks displayed in the Windows Explorer. On your PC, launch the Windows Explorer (WINDOWS + "E" key). Locate the "Network" icon. Right-click on it and click on the "Connect network drive" option. 1. Switch ON your MAC. 2. In the top bar, click on the menu "Go" menu and then click on "Connect to server ...". 3. In the Server Connection window, enter the IP address of your Zappiti drive. Then click "Log In". 4. In the next window, select the "Guest" option, then click "Sign In" and wait. Warning! The connection may not succeed. Feel free to repeat the operation several times until the Mac can connect. 5. You will see the hard drive (s) connected to the Zappiti 4K HDR. 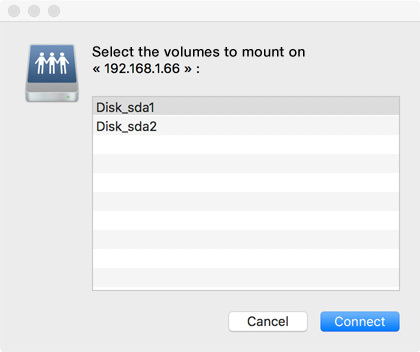 Select the volume (s) you want to mount on your MAC, and then click OK.
6. The hard drives will then appear on the desktop of your MAC and you can then drag and drop files on it to transfer the files from your MAC to the hard drives connected to your Zappiti player. WARNING! If you set the Zappiti player ethernet in Dynamic IP Address (DHCP), if the IP address of the drive changes, hard drives will no longer be accessible from the MAC. It will be necessary to restart the configuration of the MAC.